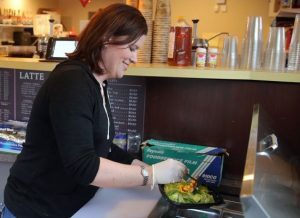 Barely seven months after opening in Poulsbo, owners of a salad-to-go shop are planning a second location in Silverdale. Greens On Your Way founder Jenn Fredericksen signed a lease Friday on the 9517 Silverdale Way space recently vacated by Genuine Burgers. 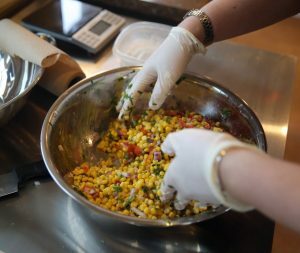 Fredericksen plans to sell her grab-and-go gourmet salads at the shop, along with wraps, pita sandwiches, soups, smoothies and espresso. The new location could open in October. “Hopefully Silverdale will be a good spot for us,” Fredericksen said. Fredericksen, who also owns latte stands in North Kitsap, opened the first Greens On Your Way in February on Poulsbo’s Viking Avenue. The business applies the coffee stand model to fresh-made salads, allowing drivers to grab packaged greens on the go. The shop encourages customers to pre-order their salads online, further streamlining sales. Fredericksen said the concept caught on in Poulsbo, despite the shop being located on the edge of town. “The feedback has been great,” she said. The Silverdale Way space doesn’t have a drive-thru, but Fredericksen said two parking stalls will be designated as drive up spaces, where customers can have salads delivered to their car window. You can check the Greens On Your Way Facebook page for updates.